Three people were hit by gunfire Wednesday in San Francisco’s Oceanview neighborhood including a woman who was killed, and two men who suffered non life threatening injuries. 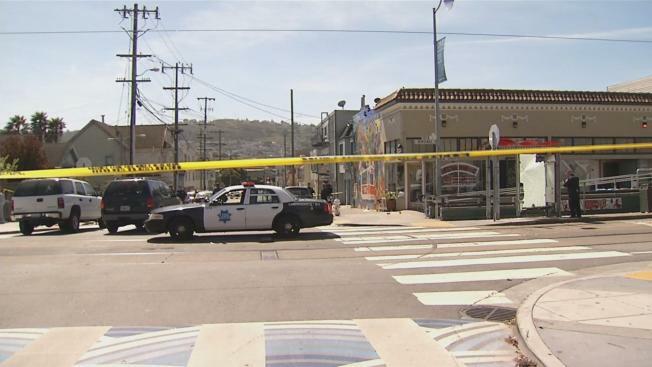 Police have made an arrest in a triple shooting that left a woman dead and two men injured Wednesday in San Francisco, according to San Francisco police. SFPD Narcotics officers on Wednesday detained 24 year-old Vallejo resident Jonathon Santos not long after the shooting that killed 65-year-old San Francisco resident Lian Xiu Wu and injured two men, ages 40 and 51, in the city's Oceanview neighborhood, police said. After being interviewed by homicide detectives, Santos was charged with murder and two counts of attempted murder and booked into San Francisco County Jail. Although there has been an arrest, investigators asked anyone with information on the shooting to contact the San Francisco Police anonymously at 415-575-4444 or text-a-tip to TIP411 with SFPD at the start of the message.